George Graham Reviews Michael J. Miles' "Collage"
The banjo can be an interesting instrument. It's got an ancient tradition, appearing in various forms on various continents, including Africa, hundreds of years ago. It was an important part of early jazz. But for the last 50 years or so, it has been most frequently been associated with bluegrass. The banjo is famously limited in its capabilities -- with almost no ability to sustain a note, and very little dynamic range -- loud banjo is about the same volume as soft banjo. But it has spawned some significantly creative figures in music. In the early days of bluegrass, it was Earl Scruggs who virtually invented the bluegrass picking technique. In more recent decades, some ambitious musicians have sought to expand the musical range of the banjo. Most famously, Béla Fleck has taken the instrument to places where it where it was hardly ever seen. His mentor, Tony Trischka, also has been famously eclectic with the instrument. Other banjo players who have sought to break the mold include Scott Vestal, Pete Wernick, and Alison Brown. This week, we have yet another banjo eclecticist with an impressive new recording. He is Michael J. Miles, and his new fourth CD is called Collage. Michael J. Miles is from Chicago, where he grew up and still lives. He came from a household where everybody sang or played music, though not necessarily professionally. But he was exposed to all kinds of styles, and that has permeated his own music. He plays banjo in the clawhammer style, a different technique than the ubiquitous Earl Scruggs three-fingered bluegrass picking style. With an MA music, Miles has taken a wide-ranging career path. He's a composer, and has collaborated with a lot of interesting people including performing with Béla Fleck, Pete Seeger, classical groups, and Corky Siegel's Chamber Blues. He was founding president of the Folk Alliance, a national organization, and was involved with Chicago's famous Old Town School of Folk Music. He teaches in the both Chicago Public Schools and for the past dozen years or so as a visiting professor at Villnova University. He has also created musical theatrical works that have been performed in various venues, and has served as a musical ambassador for the US State Department, touring Morocco. On this new recording, he assembles an unusual combination of instruments for his regular group: banjo plus vibes, trumpet, along with bass, drums and a percussionist. On several tracks, he borrows the string quartet from Corky Siegel's Chamber Blues -- the Chamber Blues Quartet. The result is banjo music as sonically surprising as a Béla Fleck or Tony Trischka recording, with the added difference of Miles' clawhammer technique. Miles also plays some different banjos, including a fretless banjo, and what sounds like an African kora. The material includes original pieces that have a vaguely classical sound, some genuine classical music arranged for the group, a familiar jazz tune, a blues standard, a traditional folk and a cover of a song by the band Little Feat. Each one provides a fascinating sonic departure, even for banjo fans, with some of the technique and instruments Miles uses. Michael J. 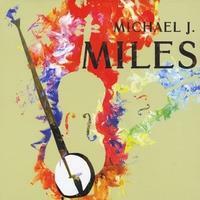 Miles is another of those brilliant and very eclectic musicians who happens to be a banjo player. Perhaps it's an effort to break out of the perceived limitations of the instrument, or maybe it's just coincidence that we have players like Béla Fleck, Tony Trischka and Michael J. Miles mixing genres with abandon with a banjo on their knee. In any case, Michael J. Miles' Collage is a excellent and pleasantly surprising recording that's also attractive and very listenable for those who might not be so heavily into genre mashing. Our grade for audio quality is about an A-minus. The instruments are well-recorded and the timbre and quality of sound of the banjos is true. But the sound is compressed more than it should be, in the usual mindless quest for loudness. There are lots of jokes about banjos and banjo players, based on the old stereotype of the limited capabilities of the instrument. But Michael J. Miles and his banjo cohorts are having the last laugh.